There is a wide variety of cloud formations in the sky and cloud tags clouds are one of them. What do these clouds look like? What makes them different from the other cloud formations? What type of weather do they bring? All these and more are discussed in the succeeding paragraphs. Read on. Cloud tags clouds are low-level cloud formations that have torn-like appearance and normally found at the base of a parent cloud. They typically form and disband rapidly, though in some cases, they are lasting and develop close to the surface. Cloud tags are often found associated with scud and fractus clouds, and their presence with thunderstorm cumulonimbus clouds implicate upcoming heavy rains, strong winds, lighting and hail. At What Altitude is Cloud Tags Found? Cloud tags are often found along rain shafts. 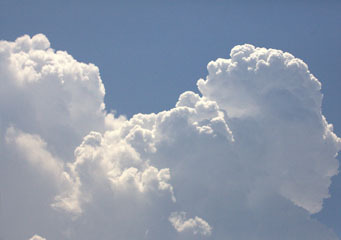 These clouds belong to the group of low-level clouds, hence, cloud tags are found less than 6,000 feet from the ground. Their existence is a sign of strong wind movements beneath the main cloud. Cloud tags may come in the form of fractus cloud or scud cloud. These cloud formations are further classified into varieties or species. Let’s consider them closely. This cloud formation may take the form of stratus fractus or cumulus fractus. Stratus Fractus has a distinctive small, torn-like cumulus cloud, which often has a darker color found beneath a nimbostratus or cumulonimbus cloud. It typically appears during, before or after a rainfall, thus bringing with it a light drizzle. Cumulus fractus and stratus fractus are so much alike except in size. Cumulus fractus is the larger version of stratus fractus appearing like worn out and fragmented cumulus cloud. It may develop from dispersing cumulus cloud and can be found on the sprawling ends of summer storms during humid and warm weather conditions. This particular cloud closely resembles stratus fractus that develops under rain clouds as a result of strong air movements under the parent cloud. However, fractonimbus doesn’t produce rainfall by itself. In due course, the fractornimbus cloud may merge completely with the protruding parent cloud. This cloud formation is characterized by ragged cloud fragments and is detached from the parent cloud. When found in thunderstorm outflow, scud clouds move faster compared to thunderstorm clouds themselves. In addition, the scud cloud has a tendency to rise and exhibit active movements. Cloud tags clouds develop when cold air from a thunderstorm outflow lifts the warm air near the ground and condenses before reaching the parent cloud. This intervention occurs due to strong atmospheric turbulence underneath the parent cloud. Turbulence pushes the rising air away from the thunderstorm cloud thus forming a ragged-like appearance. Due to turbulence at the bottom of thunderstorm cloud, the cloud tags’ appearance constantly changes and disappears. The ragged, fragmented, torn-like appearance of cloud tags is attributed to turbulence at the base of the thunderstorm cloud. If cumulus clouds look like puffy, floating cotton balls; cloud tags appear like torn-out cotton candy. Their bases are not clearly defined and may appear darker than the storm cloud. Cloud tags are commonly seen on the outer edge of a gust front. Sometimes, they are closely associated with shelf-like arcus clouds and are seen worldwide. When cloud tags cloud appear in the sky, wait no more as heavy rain is about to fall.